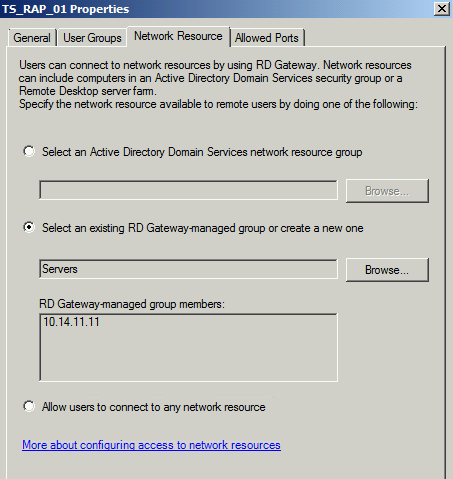 In part 1, we migrated the local user accounts and groups from the Remote Desktop Gateway server, RDG08, to RDG12. 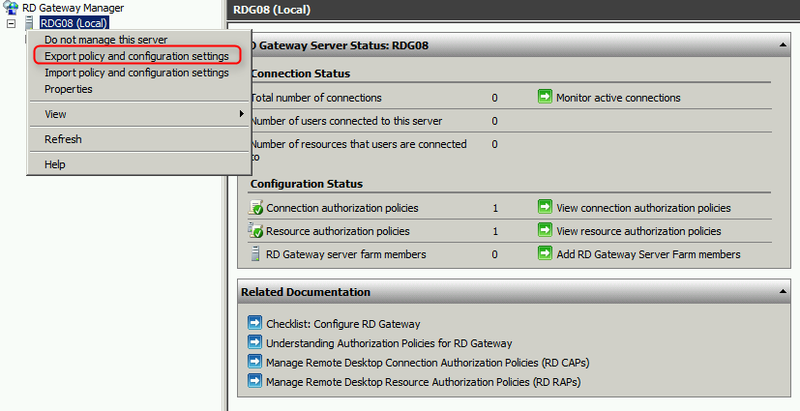 In this part, we are going to migrate the Remote Desktop Gateway server settings like "Connection Authorization Policies" and "Resource Authorization Policies" from RDG08 to RDG12. 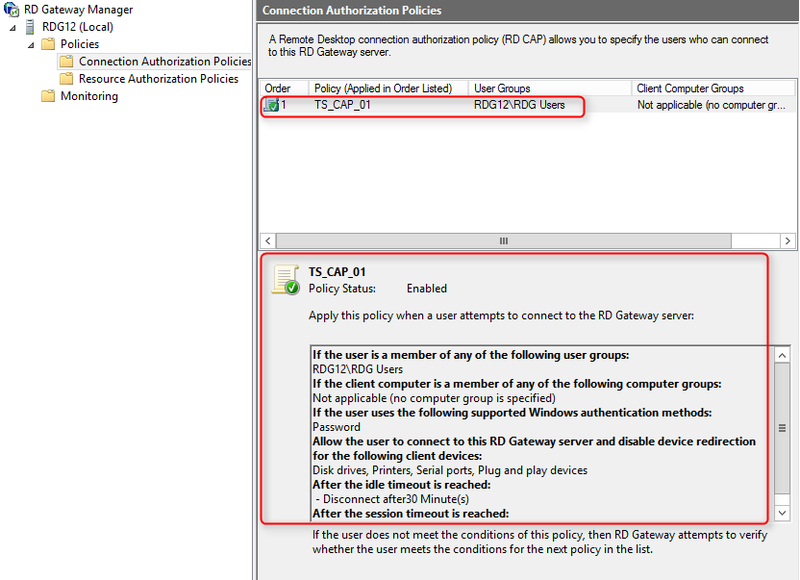 This part is intended to migrate "Connection Authorization Policies", "Resource Authorization Policies" from RDG08 to RDG12. 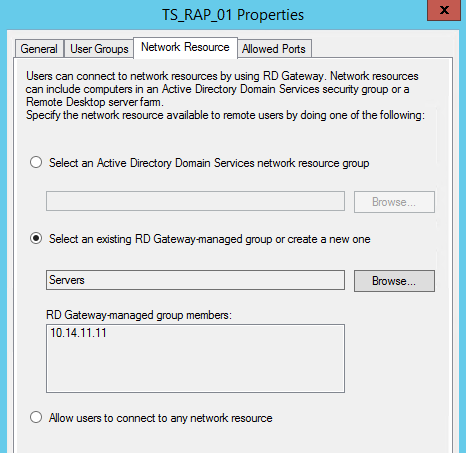 To install Remote Desktop Gateway feature in Windows Server 2012 R2, please follow the steps of "Renaming primary DNS suffix of the server" and "Installing the Remote Desktop Gateway features" on "Deploy Remote Desktop Gateway in Windows Server 2012 or Windows Server 2012 R2 workgroup environment". 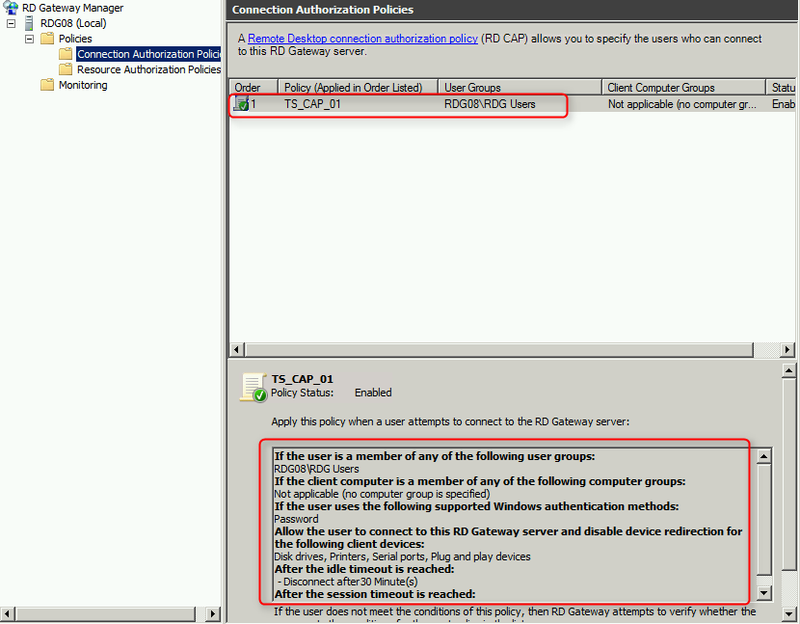 In RDG08, there are 1 "Connection Authorization Policies" and 1 "Resource Authorization Policies" with some settings. 1. On RDG08, log in as Local Administrator. 3. Right-click "RDG08 (Local)", select "Export policy and configuration settings". 4. On "Export Policy and Server Configuration Settings" window, next to "Location", enter "C:\Mig". 6. On "RD Gateway" windows, click "OK". The policy settings file has been exported to the Share folder. 7. Go to RDG12, log in as Local Administrator. 8. 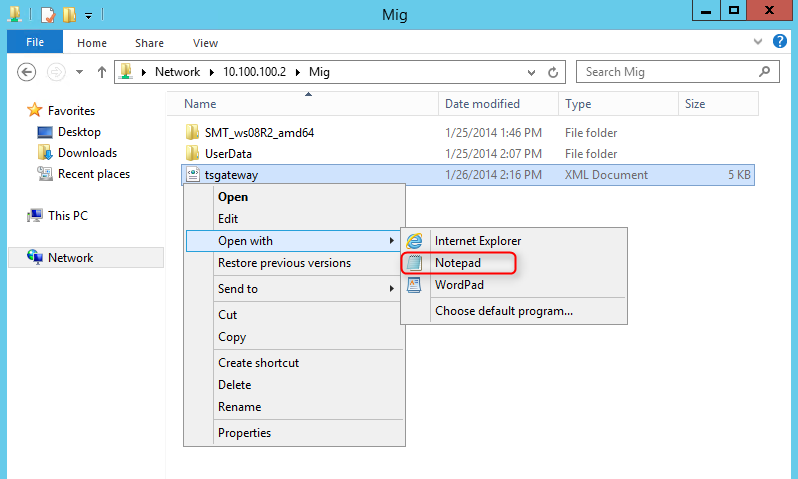 Launch "Windows Explorer" and navigate to "\\10.100.100.2\Mig". 9. 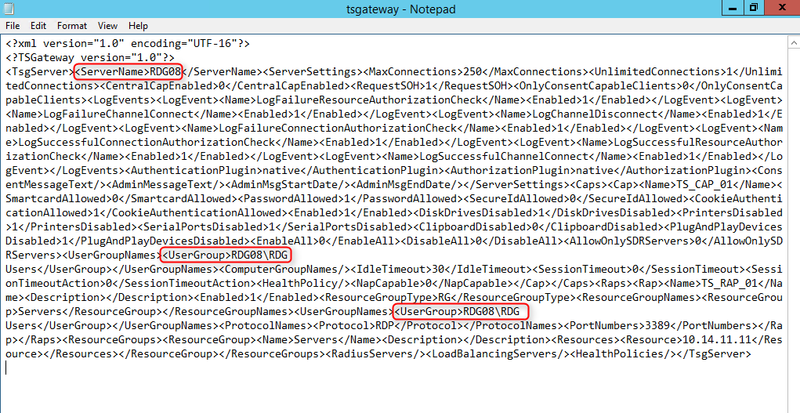 Right-click "tsgateway.xml", select "Open with > Notepad". 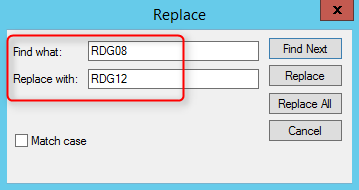 The Server name and User group name don't match the new server name, RDG12, so we have to change it from RDG08 to RDG12 before importing the settings. 10. On the menu, click "Edit > Replace". 11. On "Replace" window, next to "Find what", enter "RDG08". 12. Next to "Replace with", enter "RDG12". 14. Close the "Replace" window. Now, the Server name and User group name have been updated. 15. Save and exit "tsgateway.xml". 16. Launch "Remote Desktop Gateway Manager". 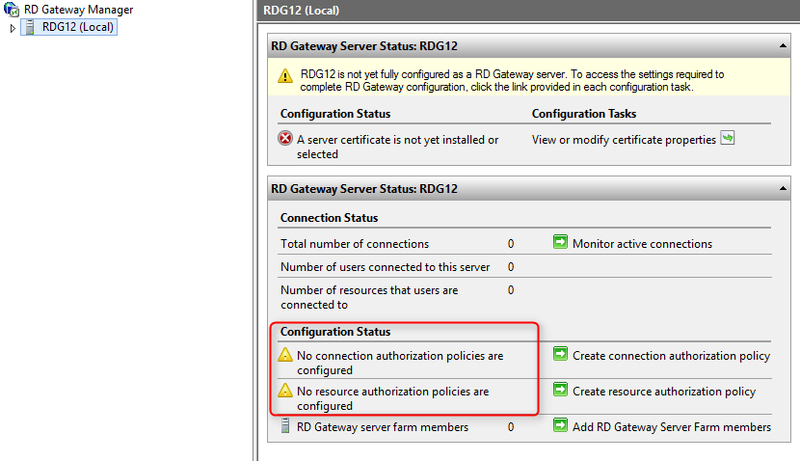 There is no "Connection Authorization Policies" and "Resource Authorization Policies" in RDG12. 17. 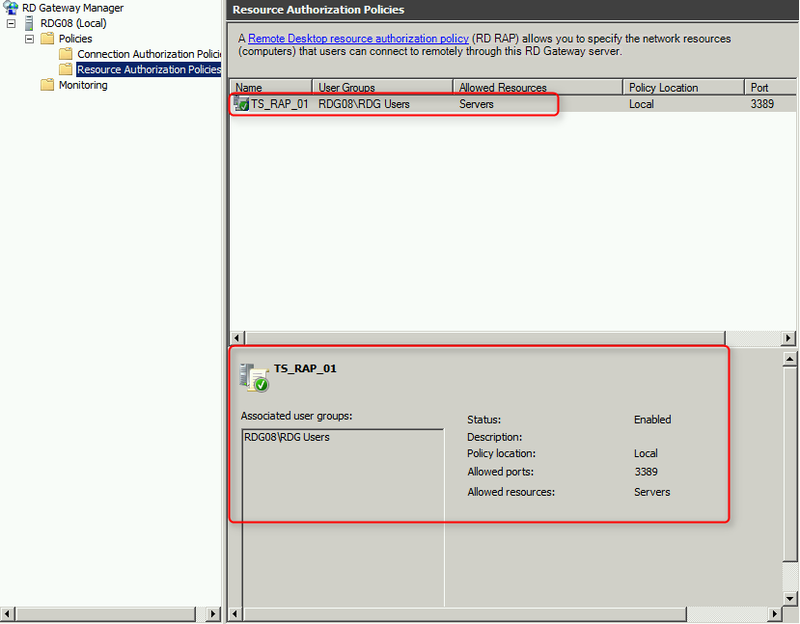 Right-click "RDG12 (Local)", select "Import policy and configuration settings". 18. 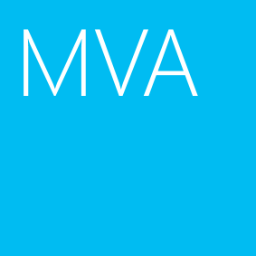 On "Import Policy and Server Configuration Settings" window, under "Specify the file that you want to import", enter "\\10.100.100.2\Mig\tsgateway.xml". 20. 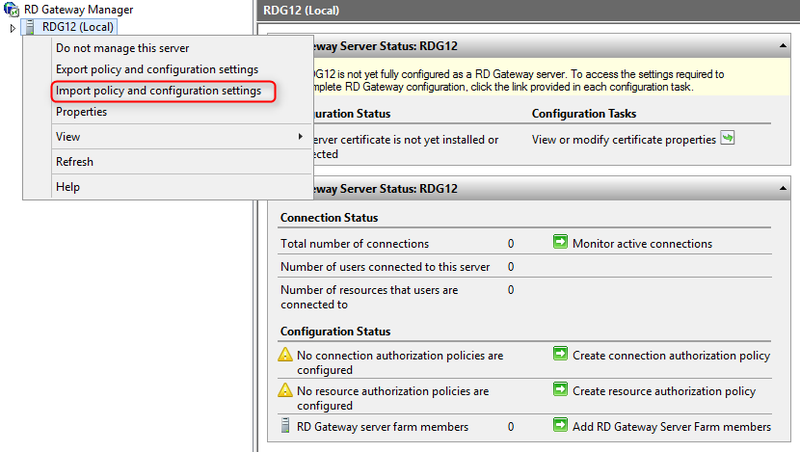 On "RD Gateway" window, click "Yes" to import the settings to RDG12. 21. On "RD Gateway" window, click "OK". 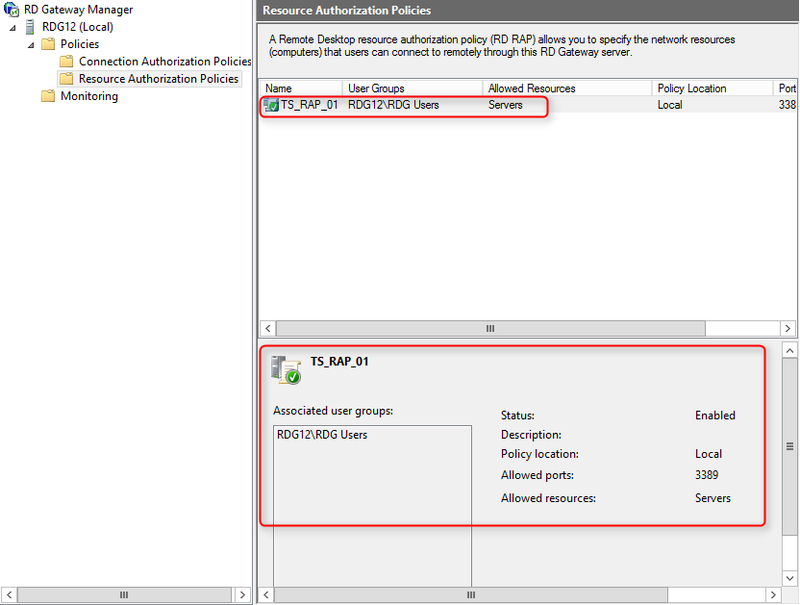 The "Connection Authorization Policies" and "Resource Authorization Policies" settings have been imported in RDG12. Please go to following web sites to read the other parts of this series.